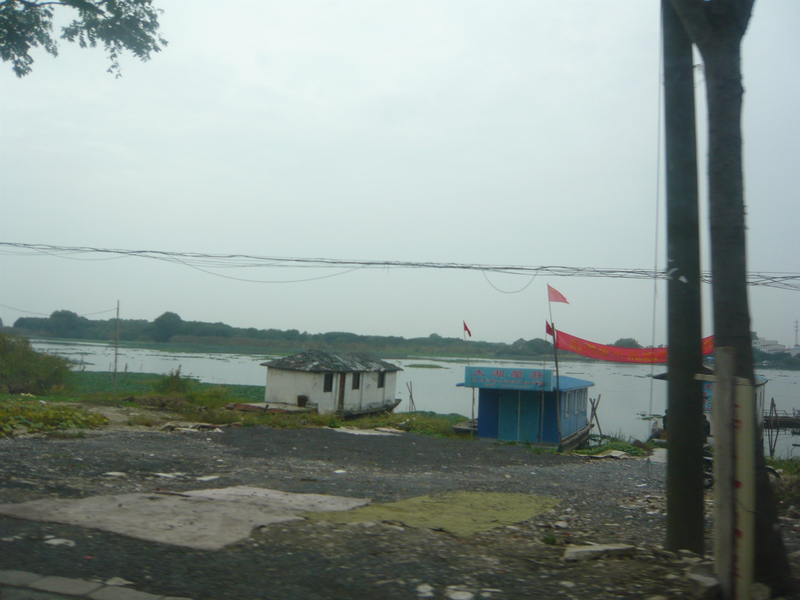 Author’s note: This is the last art on a three post series on my trip to a Chinese Water Village. After a fascinating two-hour speed tour through lovely Zhouzhuang, it was time to head out and catch our ride back into Shanghai before the horrendous weekend traffic arrived. Our tour guide Gloria told us that traffic in urban cities was particularly bad on Fridays because many of the migrant factory workers returned home to their villages. It was nearing two pm and we were getting close to hitting the danger zone when it comes to weekend traffic. Yet, we had to do at least a little shopping! 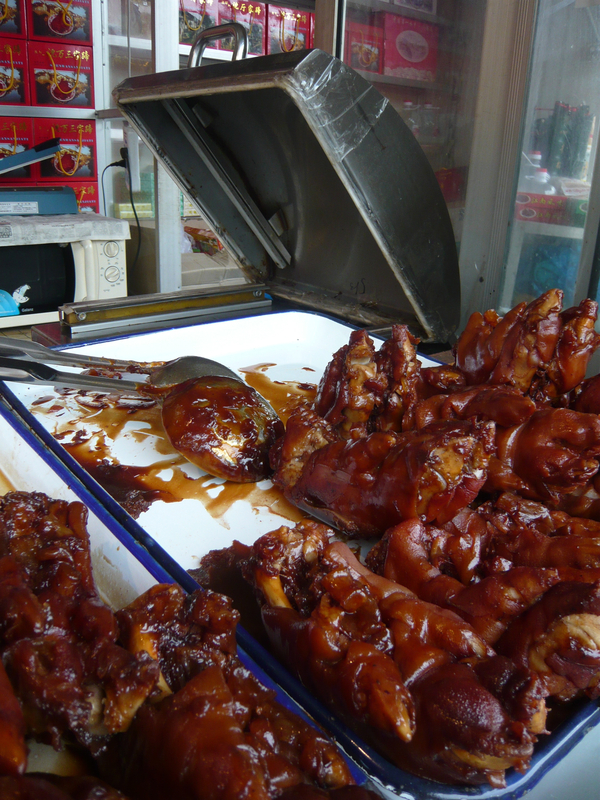 As with any tourist destination, Zhouzhuang has its specialties and we were ready to discover them in breakneck speed. 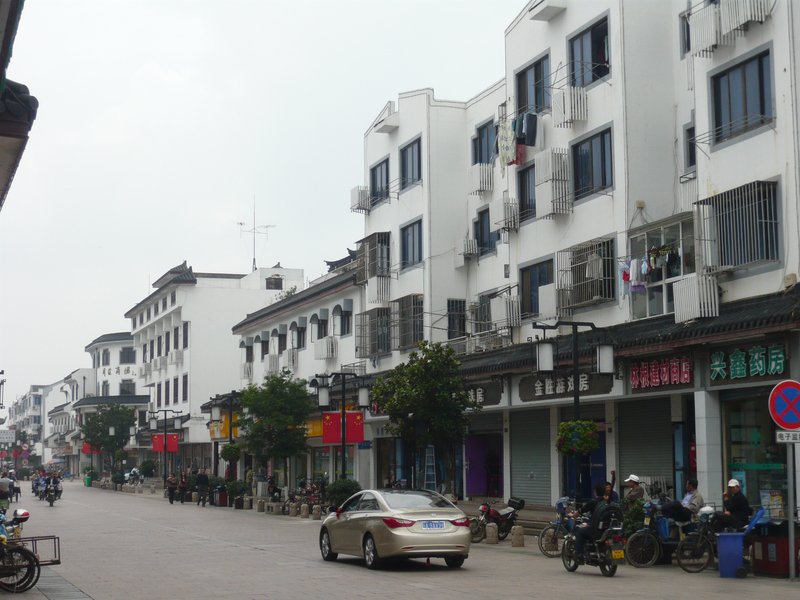 This is the entrance to Zhouzhuang before the actual water village starts. As you can imagine, it is stocked full with Chinese shops selling silk, art, tea and other local goodies. Gloria warned us to not buy any silk because oftentimes it is not real 100% silk as the label claims. She said that it is usually fake here unless you buy it at the source, a silk factory. 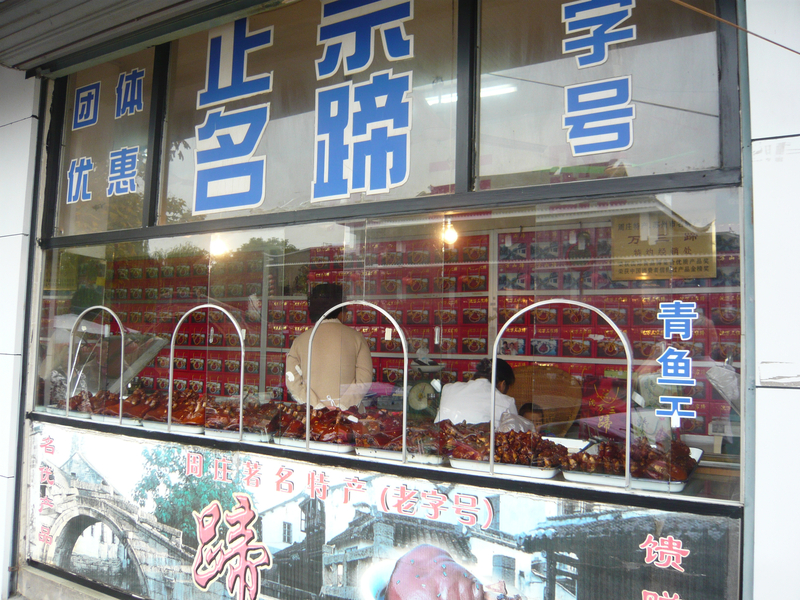 As you enter town, you see storefronts full of these tasty local treats….pork feet including toes, snouts and whatever other part of a pig available, is dipped and baked in this bean sauce…a messy, local specialty that you can get to go. I can’t imagine how messy it would be eating on the go! Yet of course I saw plenty of people doing it. Another local treasure is crayfish like these. They were of course alive and I’m not sure how they are eaten. Since I’m not keen on this kind of gourmet indulgence, I passed. I am sure they are good and not as crazy as eating a scorpion. Yet, they did not look that appetizing to me. 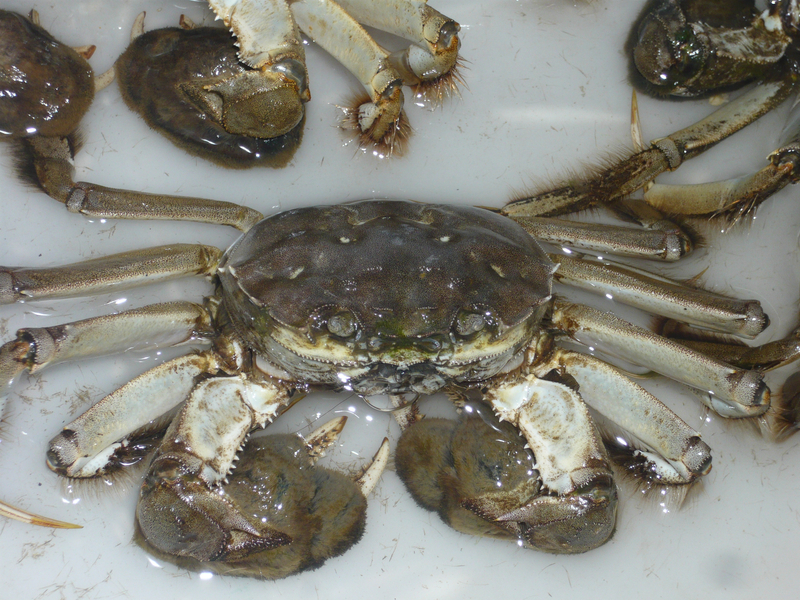 The Hairy Crab is the local delicacy of Zhouzhuang as it is caught right outside the water village in the connecting lakes. Gloria informed us that tourists from all around the world come to the village just to eat these treasures and they are in season in late Fall. This crab is saying hello to me! 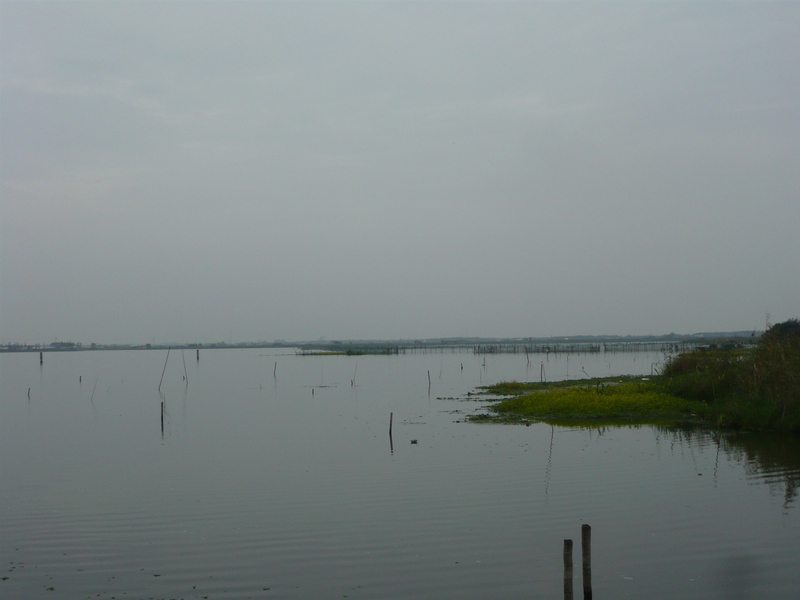 This is the lake surrounding the village where the crabs are caught and that takes the fisherman all the way to Shanghai. 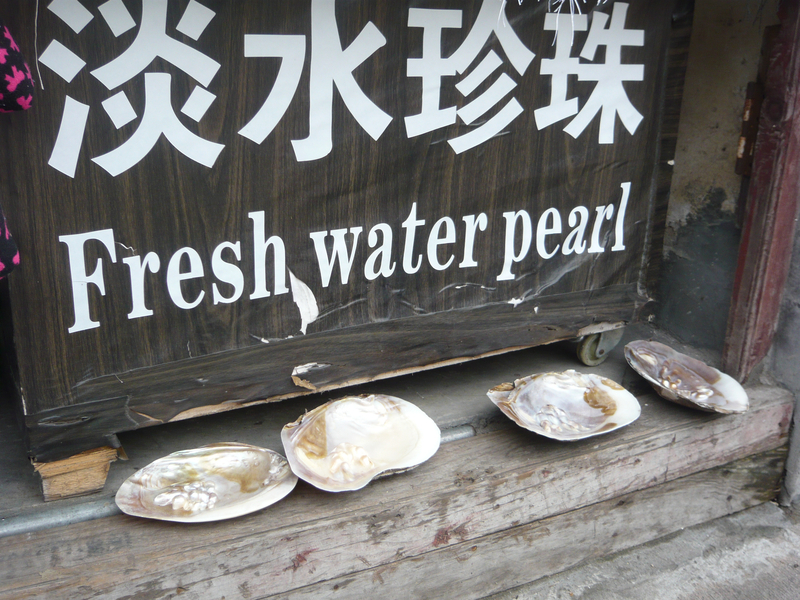 Zhouzhuang is also known for its spectacular fresh water pearls and delicious oyster. 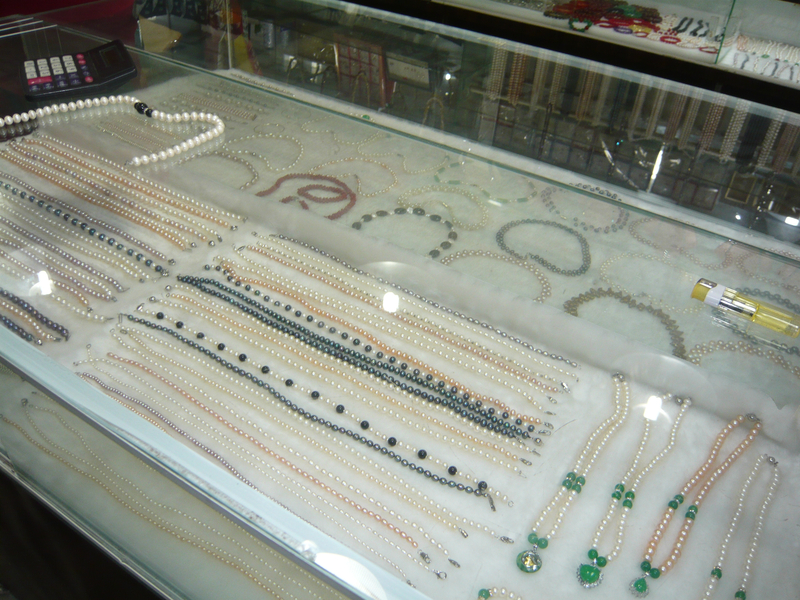 There were plenty of pearl shops in town and Gloria brought us to her favorite one to browse the pearls. They were beautiful and beyond cheap. My dad bought my mother a fresh-water pearl necklace. It was a very good deal to say the least. While I purchased myself a pair of $3 (no joke) pearl earrings for myself and another pair for my sister. I wear them all the time and adore them. 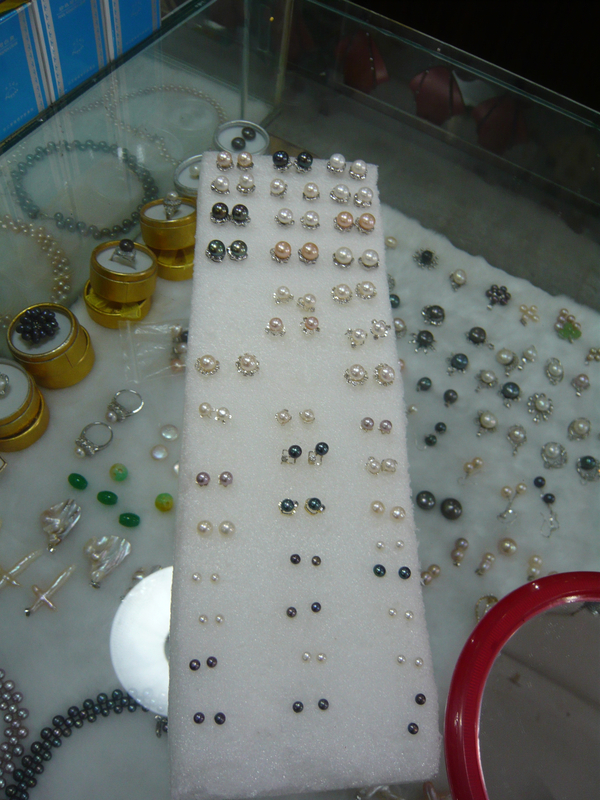 You could never find a pair of pearl earrings for $3 in the States. 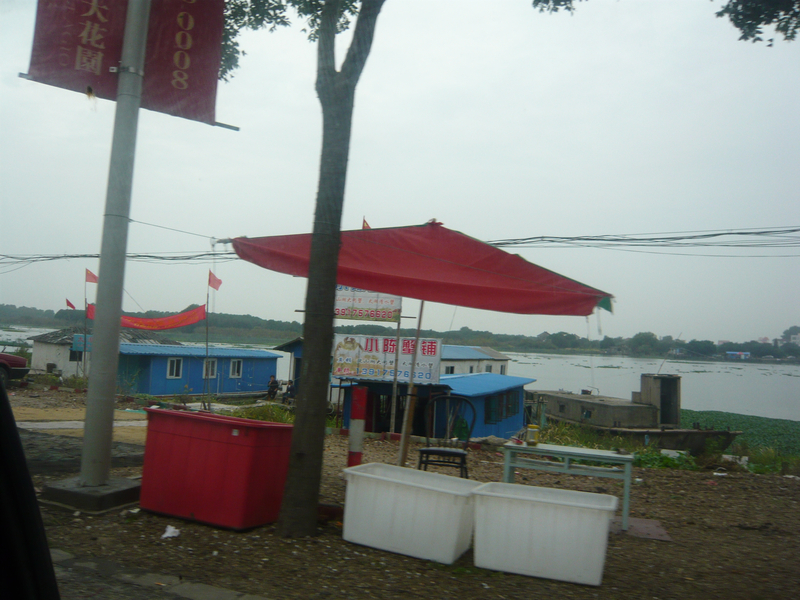 As we left the water village, Gloria pointed out the hairy crabs boats and companies where the fisherman set off to capture them. As we left Zhouzhuang, Gloria opened up more about her life. She is a mother of one child and her family owns their own apartment, a huge deal, outside of Pudong. She commutes an hour to and from work each day via bus. She is quite proud to have a college degree as her parents were part of the Cultural Revolution thus were shipped off to work in the countryside and never were able to go to university. Gloria is very proud of China and where it is headed. We talked about the huge raise in the standard of living and the mass exodus of peasants leaving the countryside and coming into the big cities to work in factories. Many of these families leave their children behind to be raised by their grandparents and see them only on weekends. It is a tough life yet the pay in a factory is much more than in rural China. Thus despite the hardships and long hours, they are happier earning more money and hopefully giving their children a brighter future. What I found most interesting about my conversation with Gloria was her beliefs on the three forbidden “T”‘s: Tibet, Tiananmen Square and Taiwan. I am not sure if what she told me was the “standard party line” that she had to say since she is a tour guide or if in her heart she actually believes what she is saying. Her beliefs on Tibet is that it was “rescued by the Chinese from savagery and barbarians” and that basically the Tibetans were treated like “slaves”. On Tiananmen Square, she stated that the military had to attack the people to save them from the “gangs” that were destroying the city. Finally, Taiwan was more or less the same kind of rationale. Like Tibet, Taiwan has always belonged to the Chinese and so forth. I found her beliefs bewildering and somewhat disconcerting for these “truths” do not truly represent reality and it was coming from the young, college-educated generation. It made me wonder what truly most Chinese really believe happened and what they truly think about the Communist Regime. Perhaps we will never know the truth. 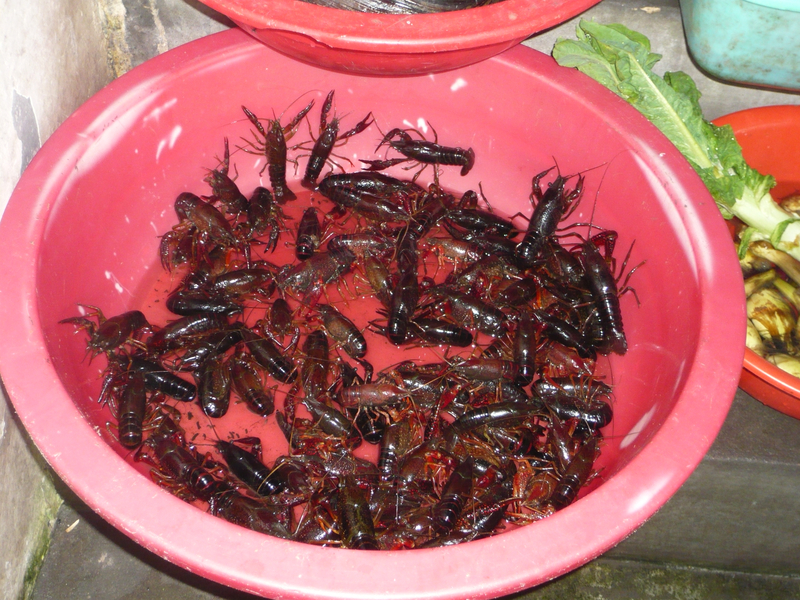 I have to agree that the crayfish don’t look too appetizing. I would have passed, as well. 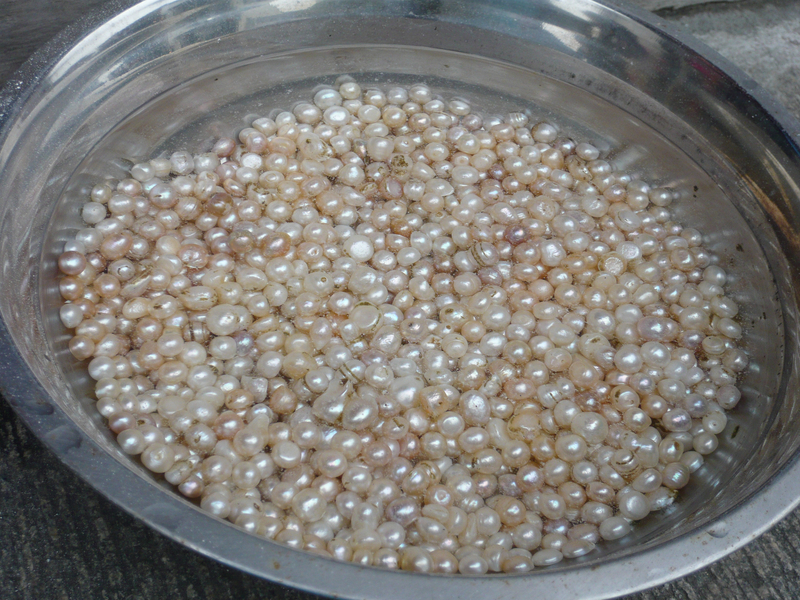 The pearls look lovely. Sara got me a stunning strand when we lived in Vietnam. Thanks Kathy! I am wearing my lovely pearl earrings now. Whew! That was one amazing live seafood journey. Crawfish is a delicacy in Houston…hot and somewhat sweet…it’s seasonal though. 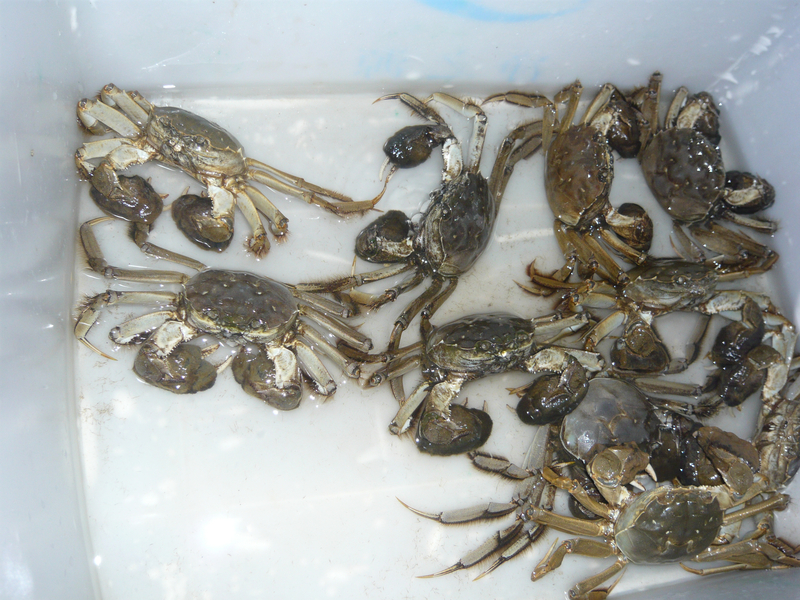 As for the hairy crab, I was told it’s delicious like dungenees or snow crabs…as for the pigs feet…indeed messy and I’m not much of a fan of that…scorpions? Don’t the poison or something? Those pearls were beautiful. I also felt sad with your tourist guide. Made me ask, “what do they teach in College?” What happened in Tiananmen square was an open massacre. The Gov’t tried to cover it up but too late, the World saw it all. I just hope it won’t happen again. thanks for sharing a post that keeps me at the edge of my seat! Stay blessed and best wishes. Thanks for reading! I love crab but didn’t get a chance to try the hairy crab. Oh well. Next time. I found the beliefs of the college educated people very tainted. It felt so strange to hear.